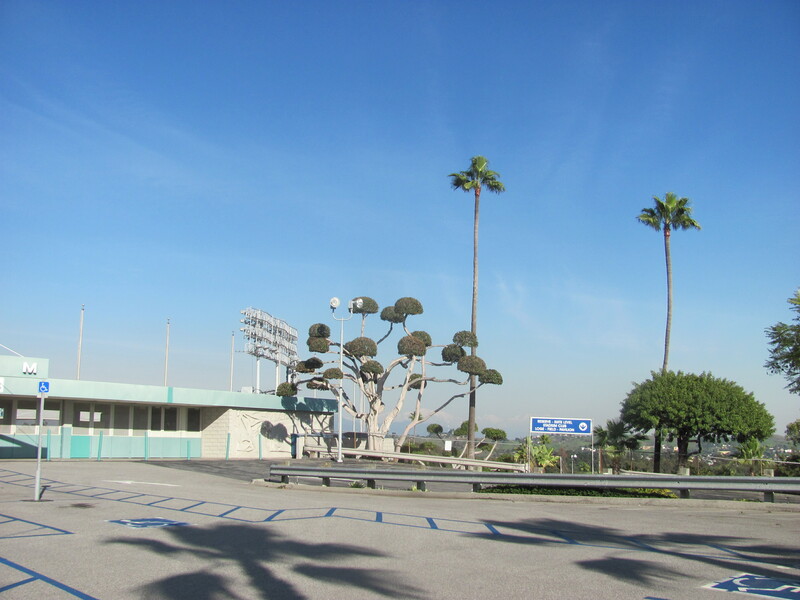 Today was my Select-a-Seat appointment at Dodger Stadium. I went hoping that the two seats next to me were available. The owner of those seats lives out of state so you always see different people there and I am always talking to my friends to the right over those two people. Anyway, no luck, the seats were already renewed. I went to the Top Deck so that I could sit in my seats! Ahhh. 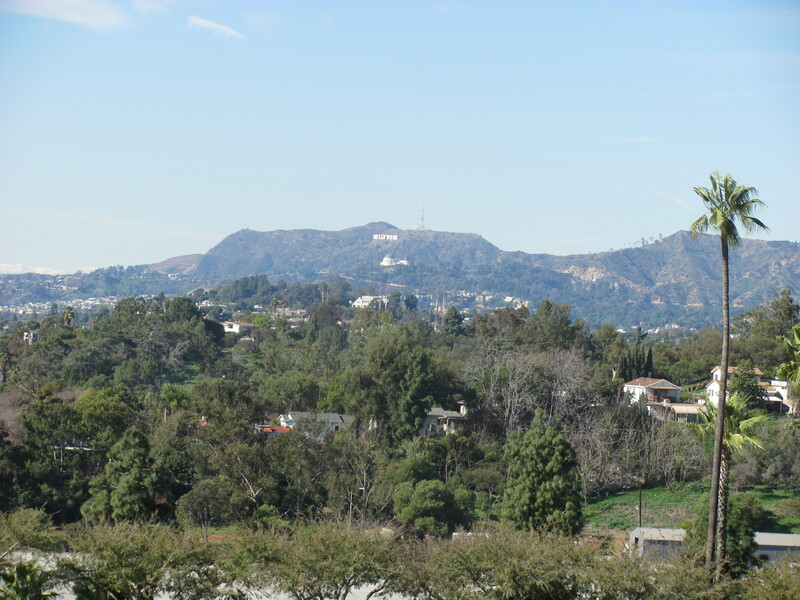 take a look at the view from there. So beautiful, so relaxing. You can see a little snow in the mountains. Here is a view of the Top Deck from the field level. 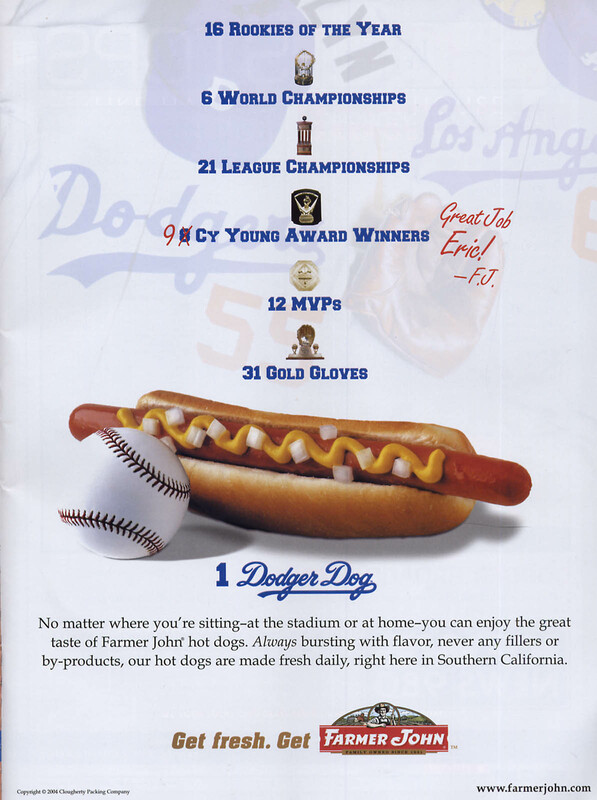 See the Dodger Logo? to the right are my seats against that wall where I put the tag so stop by and say HI if you are at the stadium. 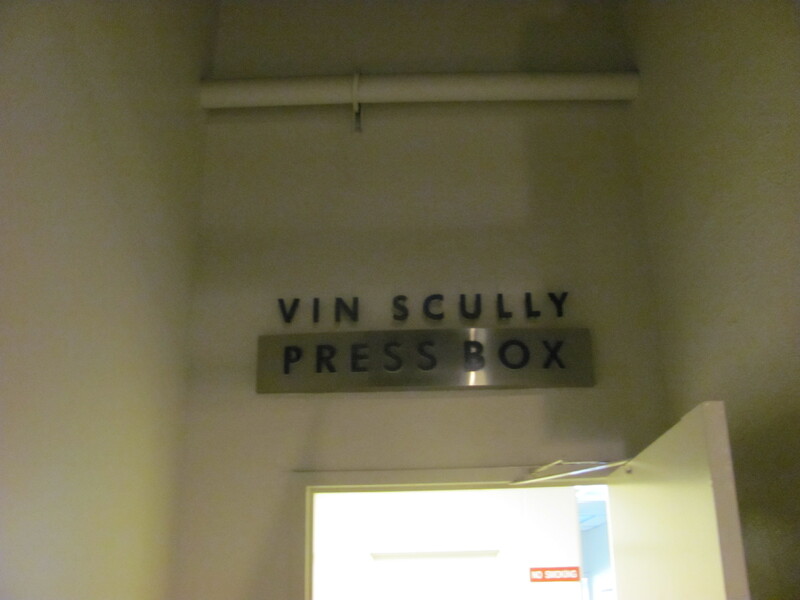 Vin Scully Press Box. The door was open but NO! I would not go in to sacred grounds! 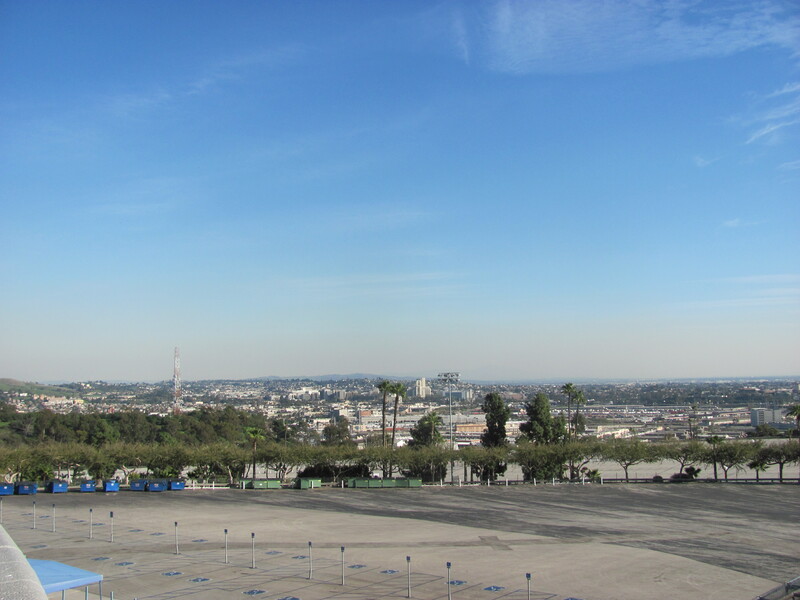 One view from the Top Deck parking lot. 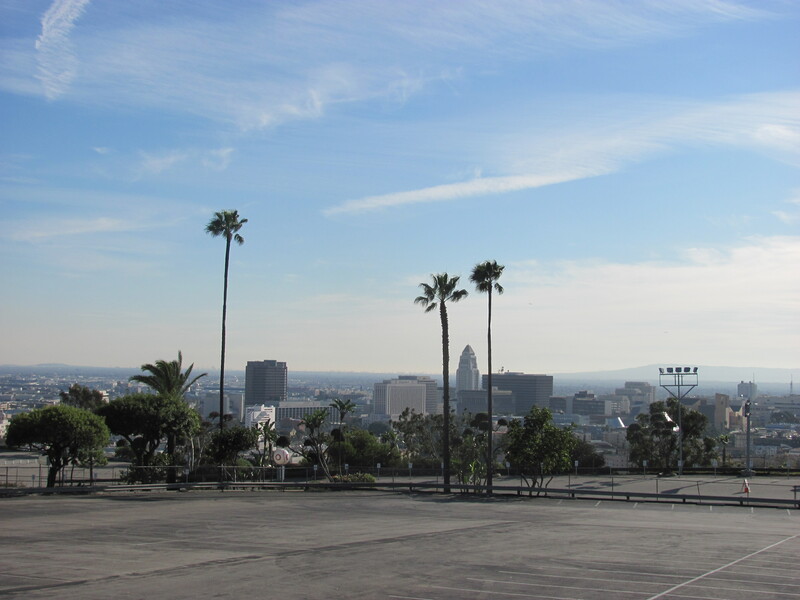 Between the two palms to the right you can see City Hall (pointy building) where scenes from Superman, Dragnet and Adam 12 were filmed. It was built in 1923. Top Deck Ticket office. I love the mural. at the other side of the mural wall is the gift shop. 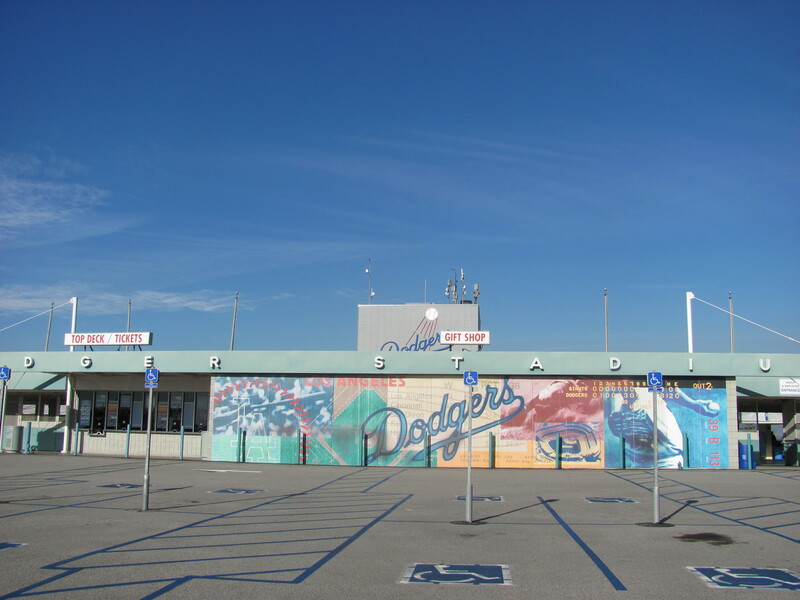 See the Dodger Logo? Is on both sides. Right there is elevator. This to the right of mural. I like the tree here. Beyond you can see snow in the mountains. This is one of the entrances for the media. I am curious about that white wall and the indentations. I don’t know what is depicting. from the dugout level. Players pass here on their way to the clubhouse. 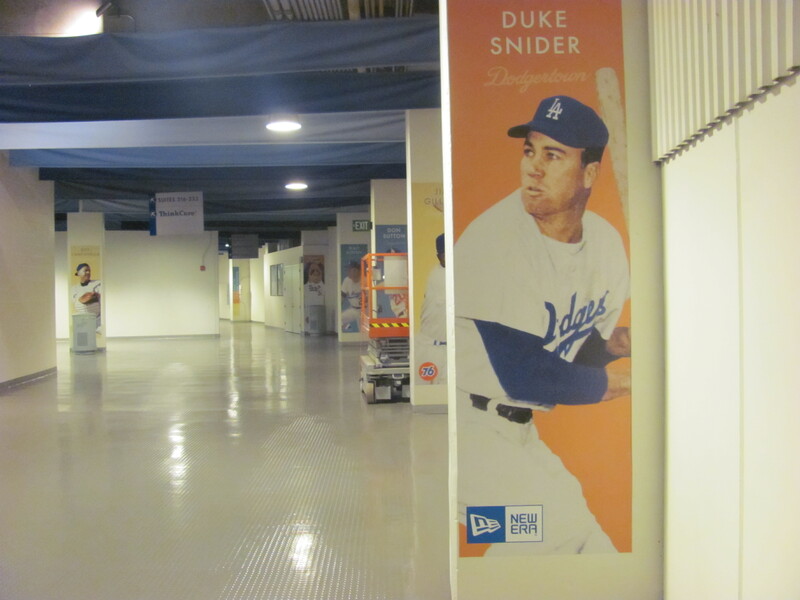 This wall has the name of every player that has played for the Dodgers. Don’t remember up to what year. 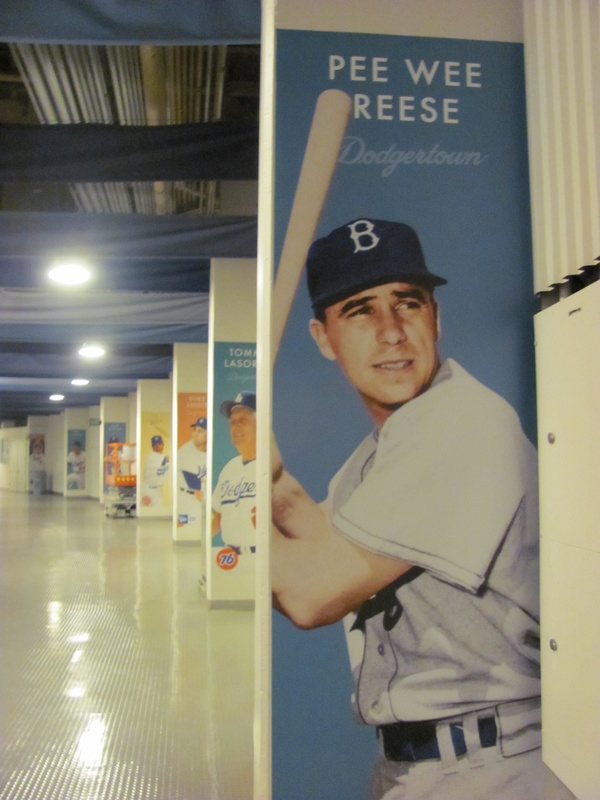 Sandy Koufax and Jackie Robinson’s names are on this part. 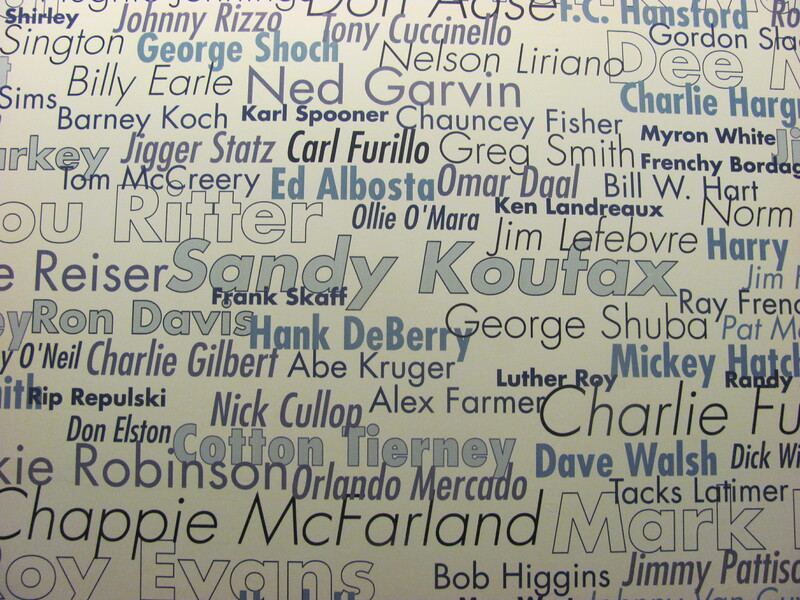 On the other side of the player’s names wall are some pictures. 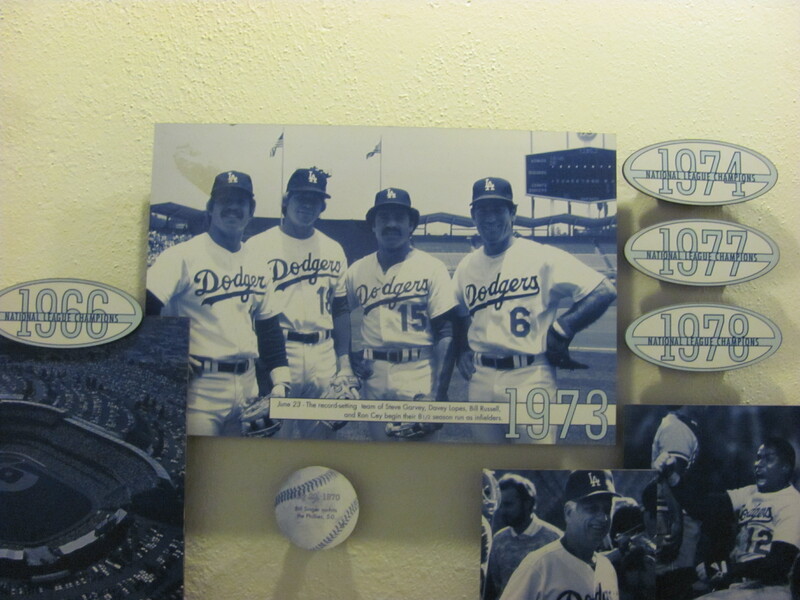 Here is one of the longest playing infield of Ron Cey, Russell, Lopes and Garvey. well, after all that I went to the gift shop! Great bargains there! The store has been having a 50% discount on the entire store since December. Some stuff is even cheaper now. Players jerseys no longer wtih the team are $20 to $30. I got other kind of t-shirts from $2.50 to $5. 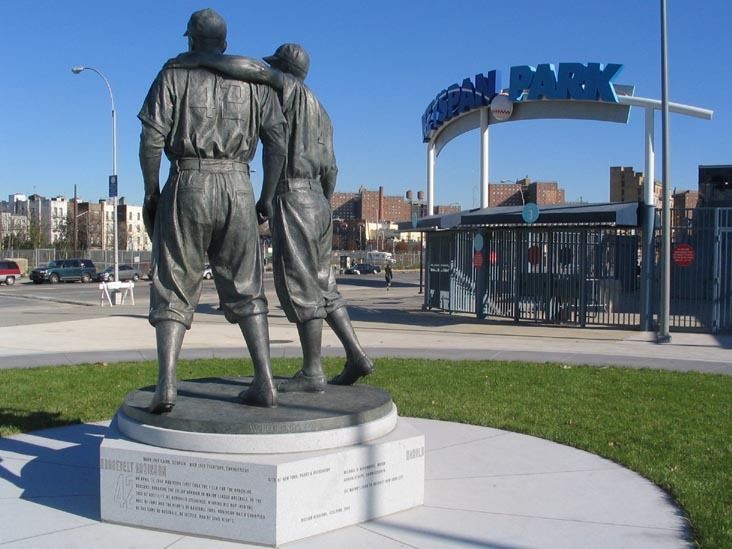 Note: I am saving the pictures of Jackie Robinson to post on his birthday. Dodgers Pirates for Breakfast. Let’s Clinch the N.L. West! Dodgers let the game get away on Sunday when they were leading by three runs in the 9th inning and Jonathan and errors gave the game to the Pirates. Is Monday morning at 10:A.M. and I am listening to the game while at work. 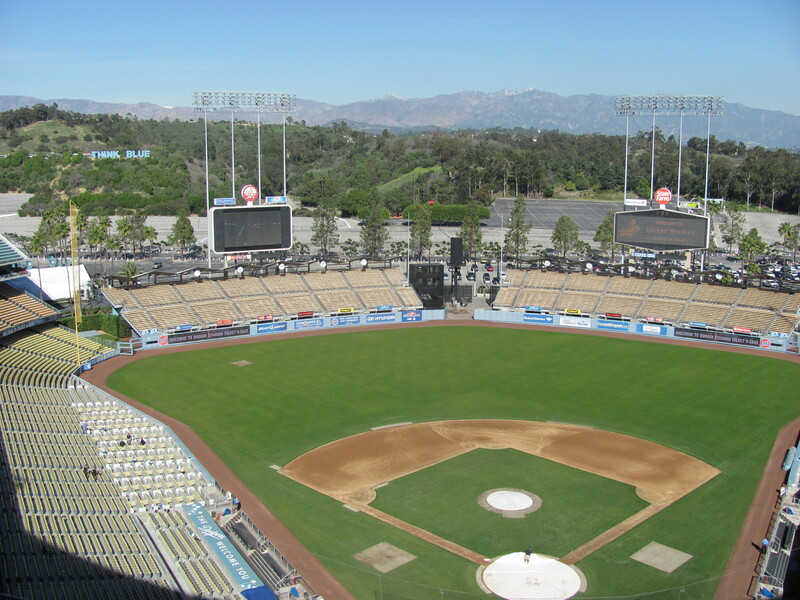 I want the Dodgers to wrap it today! I am multi-tasking as I have lots to do and I will be at the last two games in San Diego. Although it would be so cool to watch them wrap it up in San Diego with Vin Scully at the mike, I rather they win today. Dodgers losing 2-0 in the second inning and already three errors in the game! 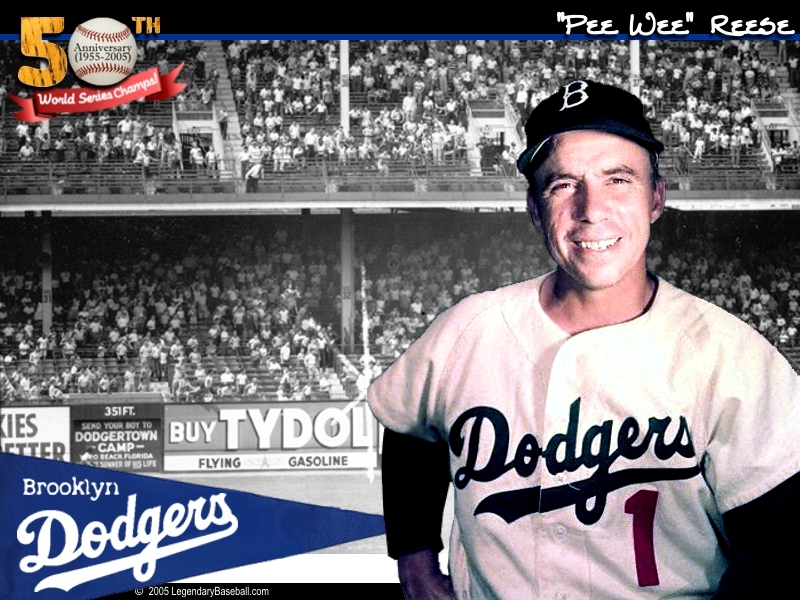 Two errors by the Pirates and one by the Dodgers. 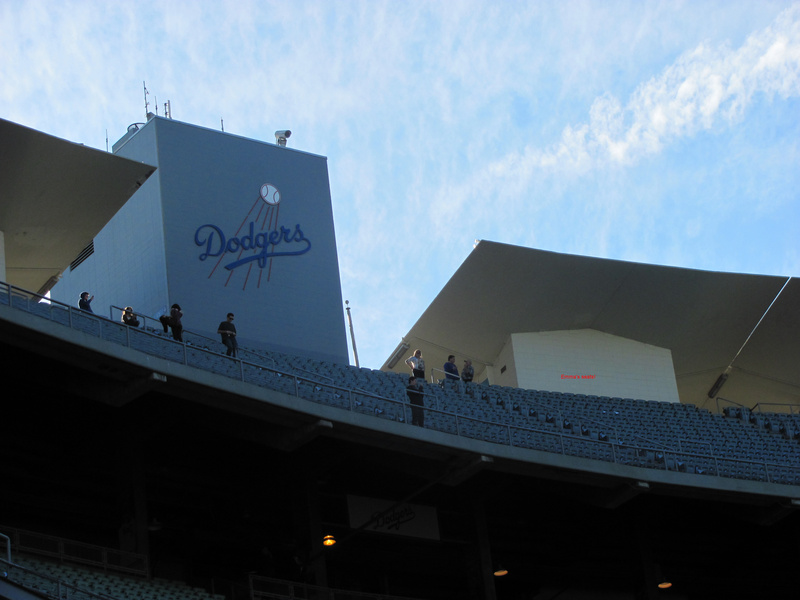 Dodgers already had some stooopid running blunders. Oh oh, 4-0 Pirates. Make that 5-0. Oh brother.